Growing your own produce is becoming hugely popular in our ecologically conscious era. Growing vegetables and fruits at home cuts down on fuel emissions and enhances organic, simple, sustainable living. Growing your own can be challenging if you are new to gardening, but with a little effort and patience you will soon be rewarded with healthy, sustainable produce. Basil, Coriander, Rosemary and Thyme, like many other herbs, will return yearly once planted. Therefore, for a relatively low cost you will have an inexhaustible supply of these versatile herbs. Broad Beans - can be planted in the autumn for an early spring crop and can be easily replaced with a summer vegetable such as runner beans. By alternating early (spring/summer) and late (autumn/winter) crops, space and yield can be maximised, reducing the need to supplement your crop with bought produce. Broccoli - as above, broccoli will produce an early crop in February/March, provided it is planted the previous April. This will involve planning ahead, but is a worthwhile way of enjoying this healthy vegetable. Brussel Sprouts and Parsnips - are planted in early spring for a late harvest. They are relatively hardy and are worth planting if you are in for a cold year. Carrots - can be sown in late February and harvested at different points of the year, depending on the variety. Courgettes and French Beans - are sown in late May/Early June for a harvest that same summer and is, therefore, a good vegetable to start your garden off with, along with other quick growing summer crops. Garlic - is planted in autumn for a late summer harvest. 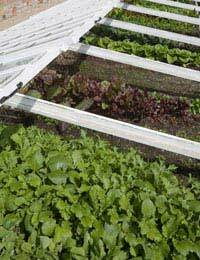 Lettuce, spring onions and radishes - can be grown throughout the year and are sown and harvested every couple of weeks. Onions 'sets' (small bunches of onions for planting) - are sown in the spring for an autumn harvest or, alternatively, can be planted in the winter for a late summer crop. Potatoes - are an essential staple food and can be planted for three different crops: 1st early - plant March, harvested 2-3 months later; 2nd early - sow late March to early April, harvested 4 months later; Late Crop - sown first half of April to late April, harvested 4-5 months later. Runner Beans - are planted in early June and can be harvested in the same summer. As runner beans are grown upright on canes, they need relatively little space. Tomatoes - will yield a good harvest throughout the summer if the seeds are sown in a pot or seed tray towards the end of April and transferred to a sunny part of the garden in early summer. Once planted, the following will grow back year on year and can all be planted in autumn/winter for a summer crop. Blackcurrants grow in bushes so will take up space, but as with redcurrants, have a fairly high yield per bush, so planting one or two currant bushes may be worthwhile even in a small garden. Gooseberries can be grown in lines (or 'cordons') so can be space efficient. Raspberries take up little space as they are grown on canes. Some varieties of raspberry produce a winter crop. Strawberries are fairly low maintenance with a 3-year cycle. Following this they will deteriorate in quality and need replanting. Even in a small city garden it should be possible to grow some of the above, reducing the need to shop. If you are going to take sustainable living seriously you will want to grow organic and this will involve devising strategies to keep your produce pest free without the use of chemicals. Some varieties of fruit and vegetable are more disease and pest resistant than others, so go for these where possible. 'Companion planting' is a popular way to protect your harvest. Different species of plants are twinned (hence 'companioned') to benefit their growth. For example, to ward off greenfly you can plant Marigolds near your crop: Marigolds attract hoverflies - a natural predator of the greenfly. You can also ward off pests and diseases by rotating your crop. By changing the positions of your vegetables and varying your crop regularly you will prevent communities of pests or strains of disease building up, as different diseases and pests are reliant on different plants. Weeds can be suppressed by covering the ground in a 'mulch' - a layer of straw or wood that will smother their growth. Regular 'weeding' is vital and can provide a good source of material for composting. Compost is used as natural supplement to garden soil and good compost will aid the growth of your crop. It can be made by blending a mixture of dry waste, such as straw, shredded wood and dried leaves, with wet waste such as green leaves and freshly cut grass. The waste is deposited in a simple enclosure (made of an old bin or palette) and must be turned regularly to allow air to get to the mixture and aid decomposition. Compost is preferable to the use of peat, which is harvested from natural peat habitats, thus damaging the environment.